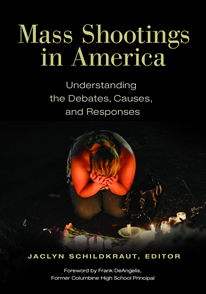 This book offers a unique hybrid approach to understanding mass shootings in the United States. The book features different research essays from experts in the field on topics including school shootings, mass shootings as hate crimes, gender issues, mass shootings as terrorism, and issues for responding law enforcement personnel. Consideration of the usual suspects of gun control, mental health, and violent media from a range of expert researchers, as well as op-eds, also is included. This unique work even includes an encyclopedia of 50 years of mass shooting events, from beginning in 1966 with the University of Texas shooting and ending in 2016, the year of the Pulse Nightclub tragedy. All royalties from this project will be donated to the onePULSE Foundation. Visit their website at https://onepulsefoundation.org/ to learn more about this organization or to contribute to establishing and maintaining this memorial site.